A wave of deregulation is sweeping through the European Commission and member states. If you care about the environment, workers’ rights, or public health, this so-called ‘Better Regulation’ agenda is highly concerning, as it is used to weaken and abolish current rules, while hampering the introduction of new ones. At the same time, big business interests take centre-stage in the considerations of policy-makers, and those with the most lobby power get the biggest say. The aim to ‘cut red tape’ via deregulation featured, for example, in David Cameron's pre-Brexit negotiations with the EU, and neoliberal free-trade deals like TTIP and CETA are set to undermine the protection of the public interest even more. You can also download this FAQ as a pdf. Deregulation is about removing or weakening rules and regulations (laws, directives, implementing acts) and other policy tools that companies perceive get in the way of business doing business. It is based on the ideological belief that markets know best and that what is best for business must also be good for wider society. Deregulation ignores all the good reasons why regulations were introduced in the first place. And while you can undoubtedly have bad regulations, protections are almost always introduced for good reasons eg. to ensure employees are entitled to paid leave after the birth of a child, or to manage the environmental impacts of corporate activities. Such protections may create additional costs to business, but the benefits of these rules greatly outweigh the costs to society as a whole. In the Unites States, the Office of Information and Regulatory Affairs (OIRA) puts together annual estimates of the benefits versus the costs of certain regulations and in 2000-12, the benefits of regulation greatly outweighed the costs, on average, by a factor of six over the period covered. Who is pushing this agenda and how? The deregulation agenda in the European Union has the fingerprints of corporate lobbyists all over it. For example, exclusive big business lobby the European Roundtable of Industrialists' (ERT) 2011 proposal demanded a complete overhaul of EU legislation, affecting current, drafted, and future regulation. At the time, the proposals seemed far too extreme to be serious, but in one form or another they have been adopted. And it was the tobacco industry lobby back in the 1980s and 1990s which first promoted ‘impact assessments’ which are a key weapon in the deregulator’s armoury, and which can, if not used very carefully, ignore the social and environmental benefits of regulation and place over-emphasis on the direct costs to business, which are easier to quantify (and exaggerate). Meanwhile, big business representatives have had privileged access to officials and decision-makers in Brussels and London via working groups, drawing up lists of the regulations which they wish to see banished. Whichever way you look at it, deregulation is an agenda of big business interests and they have found a sympathetic ear in London. In 2013, the UK government set up the Business Taskforce to “to get bureaucracy out of the way of business” at both the national and EU levels. Led by six leaders from big business and a government minister, it came up with 30 proposals for where EU regulations should be abandoned, scrapped, or reduced and included a competitiveness test. Many recommendations were adopted at the EU level, including downgrading a proposed regulation on fracking to a light-touch recommendation. But isn't cutting red tape a good thing? If you believe the media (particularly in the UK) the EU is hidebound by dreaded 'red tape', an excessive and highly paid bureaucracy requiring multiple form-filling, tick box exercises, annual checks, and high costs to comply with rules. 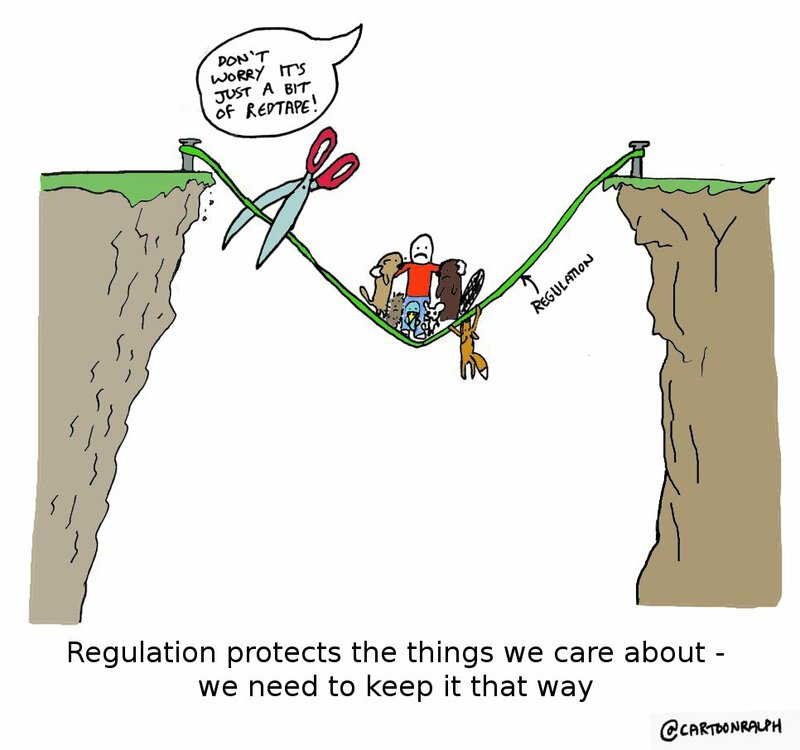 But not all regulation is administrative ‘red-tape’, far from it, and much of the deregulation agenda goes much further and ignores the good reasons why laws and protections were introduced in the first place. Such rules ensure that when companies produce or deliver services, the public interest is preserved and wider social and environmental concerns do not lose out. They can set common standards and prevent a race to the bottom in terms of workers’ pay and conditions; set out a given policy direction and create confidence to invest for the future; level the playing field between big and small businesses; and they can introduce fairness in terms of pricing and who picks up the bill for costs. 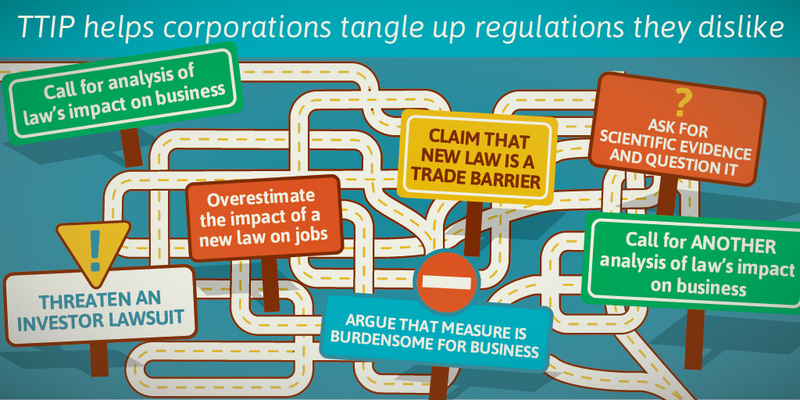 Moreover corporate lobbying can actually add ‘red-tape’ to regulations in the form of loopholes and complexities. For example, a key piece of 2009 hedge fund regulation ended up almost three times as long as its initial draft due almost entirely to the introduction of loopholes and weakening of language. And the financial lobby played no small part in this. According to an estimate, 900 of 1600 amendments were actually written by the financial industry. However, under political pressure to appease members states such as the Netherlands and right-wing eurosceptics, particularly given the Brexit debate in the UK, and after heavy corporate lobbying, the European Commission, the EU’s executive arm, has gradually moved forward with its 'Better Regulation' agenda. And as we shall see, current efforts to deregulate go far further than simply cutting ‘red tape’. Crucially the deregulation agenda has been re-branded as Better Regulation and this masks a serious effort to undermine the implementation of current rules which serve an important social or environmental purpose. Additionally, Better Regulation represents a wholesale revamp of how new regulations are to be made which sees big business given a privileged voice – ahead of elected politicians. Deregulation – why is it so alarming? 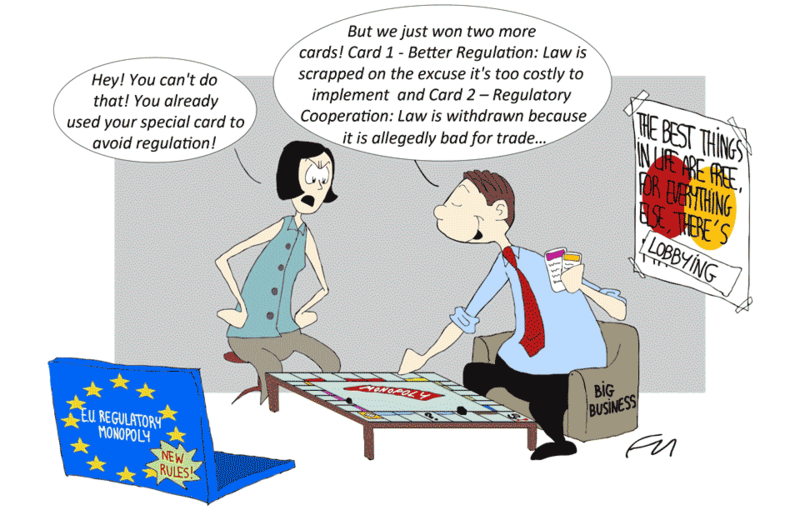 Annual scrapping of rules: Under REFIT, the European Commission’s Regulatory Fitness and Performance programme, every year the EU must screen its entire body of law to find new regulations to scrap, weaken, or simplify. In May 2015, the Commission reported that 23 initiatives had been identified for repeal. Meanwhile in 2015 73 proposals which were pending in the legislative procedure were scrapped, including plans on labelling for organic produce, investor compensation, and the waste directive. In total since 2012, more than 140 proposals have been dropped, including those on access to environmental justice, another on the protection of soil, and rules on supervision of medicines. Since 2006, the Commission had been seeking agreement on a draft agreement to minimise soil erosion, maintain the organic matter in soils and to prevent soil from being contaminated with toxic substances. Despite the importance of soil to the ecosystem and its role in preventing flooding, the proposed directive was scrapped under the REFIT programme in 2014. This followed years of Council impasse, and lobbying by the UK government and the farming industry, including the UK’s National Farmers’ Union (NFU). 'Fitness Check': A specific review for some laws called a Fitness Check which will assess whether it is “fit for purpose”, and identify “excessive burdens, overlaps, gaps, inconsistencies and/or obsolete measures”. Since the end of 2012, the Commission has reported that 11 evaluations and Fitness Checks have already “delivered results” and 31 evaluations and Fitness Checks are planned, including of highly important laws such as Safety and Health at Work; Protection of birds and habitats (Natura 2000); and General Food Law. Many of these checks are run by corporate consultants such as Deloitte which can be expected to have private sector values at the forefront. 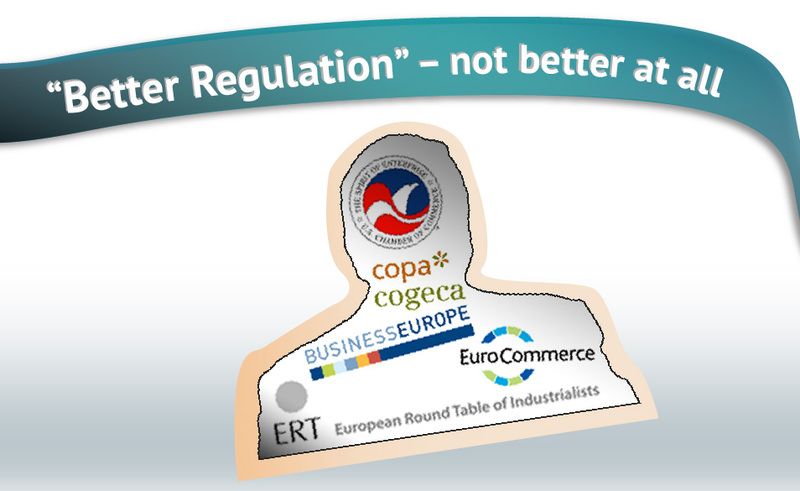 Who are the architects of the EU’s new Better Regulation agenda? A key player at the EU level pushing the deregulation agenda has been German politician Dr Edmund Stoiber who, between 2007 and 2016, advised the Commission on this issue. His period in office saw a shift in perception at the EU from regulation as a useful tool to a burden – a very dangerous development indeed. In December 2014, Stoiber was appointed as special adviser to President Juncker on Better Regulation, despite the fact that he was a controversial figure with multiple private banking and financial interests. His appointment by the Commission was investigated by the European Ombudsman who recently criticised the way in which his new role was announced, before he had undergone any conflicts of interest checks. From 2007-14, Stoiber chaired a working group on Better Regulation a group where the majority of its 15 members came from or were linked to industry interests, even if they were formally appointed on “a personal basis”. These included representatives of the pro-GMO farming and agribusiness lobby COPA-COGECA, Polish business lobby Lewiatan (member of BusinessEurope), as well as current and former executives from technology giant Invensys and coffee conglomerate Illy. Member Michael Gibbons chairs the Regulatory Policy Committee for the UK government, and is also chair of the ‘clean’ coal lobby group the Carbon Capture & Storage (CCS) Association, whose members include BP, General Electric, Shell, Statoil and other major corporations. It is perhaps not surprising that the final report of the Stoiber group proposed a strengthened deregulation agenda, one that was later adopted by the Juncker Commission almost entirely, admittedly without the recommended deregulation target. However, four members of the Stoiber group from civil society published a dissenting opinion, which strongly opposed the report’s “outdated, deregulatory agenda”. They argued that the “pursuit of reducing the overall costs of regulation on business will come at the expense of health, safety and environmental protection that these regulations provide”. By promoting deregulation as a recipe for more jobs and growth, the group had “entered the realm of fact free policy making”, which “fails to recognise the cost to society of not regulating”. 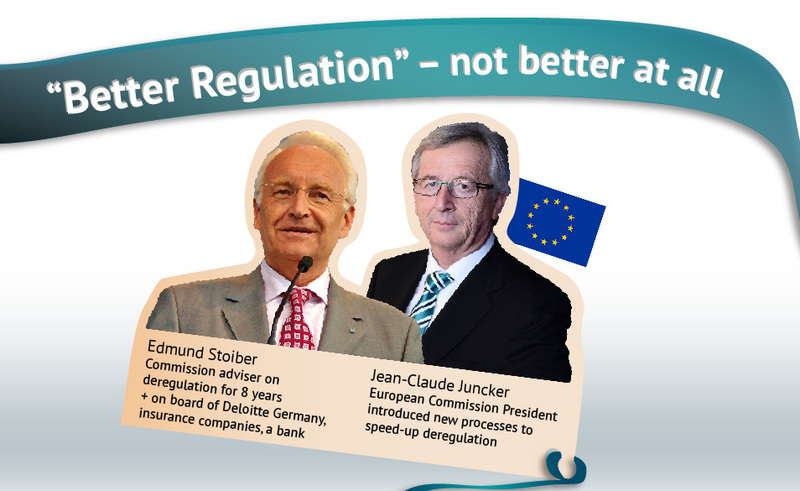 What sets the Juncker Commission’s deregulation package apart from earlier attempts? Vice-President for Better Regulation: Juncker has appointed his right-hand man Frans Timmermans as Vice President for Better Regulation, giving this portfolio more political weight than at any time previously. And this is is not just cosmetic as this role is now imbued with huge political powers. As Vice President, Timmermans gets several opportunities to veto new legislative proposals before elected politicians have even seen them, to prevent them from moving ahead, with “subsidiarity, proportionality and better regulation… at the core of the work of the new Commission”. Regulatory Scrutiny Board: This new structure, with four Commission officials and three external members, also has a de-facto veto power. It will scrutinise all the impact assessments performed on all proposals for new rules and this unelected body will be able to reject any impact assessment if it doesn’t come up to scratch (or maybe if it doesn’t come up with the ‘right’ answer), before the regulatory proposal even reaches the Parliament or the Council. Impact assessments and consultation: As well as placing a requirement for an impact assessment on all new proposals, the Commission’s statements on Better Regulation continually pledge a strong commitment to transparency and consultation. It talks about being open to feedback from citizens and stakeholders “at every stage of the process – from the first idea, to when the Commission makes a proposal, through to the adoption of legislation and its evaluation”. This rhetoric needs closer inspection. What's the problem with impact assessments? Impact assessments sound like they would be a useful, neutral tool, something which can allow policy-makers to understand the impact of the legislation which they are contemplating, and there is a whole consultancy industry set up to assess the expected impacts on a business or sector of implementing a new legislative proposal. In fact such evaluations are likely to be highly subjective, with the choice of questions and methodologies often requiring political value judgements. Additionally, it is very hard to get them right as they require a monetary value to be assigned to the expected costs and benefits of a policy; arguably it is much harder to measure the environmental and social costs and benefits, than the economic. For example, how do you place a monetary value on the health benefits for hairdressers of not using certain chemicals, or the environmental impact of a nature habitat? And what about the cost of doing nothing to tackle a particular problem? In practice impact assessments give an overriding weight to economic or trade over other impacts, and thereby undermining the environmental or social case for a given policy. It is not hard to see how an under-pressure official required to produce or commission an impact assessment on introducing or scrapping a piece of legislation will undoubtedly be grateful for, and maybe even become dependent upon, the figures on expected economic costs provided by business interests. Few environmental or social organisations would be able to compete with the ability of big business to feed in their views, especially on technical matters such as costs. Meanwhile, big business systematically ‘cries wolf’ at the prospect of stricter environmental legislation, arguing that it would harm the economy and lead to a loss of jobs. The New Economics Foundation argues that companies systemically inflate estimates of the cost of new regulations in order to get them weakened or delayed, while targets for reducing costs to business create a direct incentive for lobbyists to provide inflated estimates – since the higher the projected costs, the harder a regulation will be to introduce. This is despite the fact that a 2015 report by ChemSec shows that the benefits of adapting for business are generally underestimated, with the costs for industry to adapt to environmental policies decreasing since the 1990s. It’s not surprising then that some have called impact assessments “propaganda documents rather than self-critical policy analyses” and no wonder big business lobbies such as BusinessEurope, EuroCommerce and others called for, and have now won, a “process of gathering and analysing evidence and for scrutinising and supporting cost benefit analysis throughout the policy making process”. The EU says that its impact assessments will map out alternatives, potential short and long-term costs and benefits, and will assess the economic, environmental, and social impacts in an “integrated and balanced way”. That is the theory at least – it remains to be seen how this works out in practice. Perhaps it is not surprising that a key promoter of impact assessments to aide public policy-making came from the tobacco industry lobby. Academic research shows British American Tobacco promoted these kinds of risk assessments in the 1980s and 1990s in order to overcome the use of the “precautionary principle” in decision-making which places harm reduction at its core. A precautionary approach to tobacco would obviously see tight restrictions or even bans on aspects of tobacco use, to reduce the harm to public health. To head this off, the industry promoted impact assessments to ensure that the ‘impact’ on their bottom line was put at the heart of policy decisions, and because they were confident they could influence the process to make it more difficult to introduce rules that hurt their profits. Surely we need more not less consultation on what the Commission is up to? Impact assessments fit with the Commission’s emphasis on consultation “at every stage of the process”. The Commission has lauded its Better Regulation package as providing more opportunities for consultation and transparency and accountability of decision-making. But in this context, consultation tends to mean lobbying. At whatever stage of the policy-making process the consultation takes place, big business almost inevitably has more money, resources and capacity to surpass public interest groups and this is a pattern we already see in the Commission’s consultation processes. Too often consultations fail to achieve input from a broad range of stakeholders eg the 2015 Commission consultation on the security of gas supply received 103 responses, but besides public bodies and governments, these – practically without exception – represented the fossil fuel industry, with almost all big energy firms responding. In another case, the European Commission was “swamped” with 85,000 submissions to its consultation on the tobacco products directive, with the tobacco industry using third parties and fake grassroots campaigns to fight the introduction of plain packaging for cigarettes. According to Tobacco Control Research Group (TCRG) analysis of these submissions, “the research was of significantly lower quality than research supporting the measure [plain packaging]. For example, the tobacco companies’ arguments were not supported by any peer-reviewed journal articles about standardised packaging.” Nevertheless, the tobacco giants’ tactics resulted in a significant delay in the introduction of plain packaging. Civil society is unlikely to be able to keep pace with the swell of consultations coming its way as the Better Regulation programme rolls on. Rather than more consultations, as the Alliance for Lobbying Transparency and Ethics Regulation has written, we need a broader democratisation that empowers the engagement of citizens’ groups in decision making, as well as a far more active commitment by decision makers to defend public-interest concerns against the constant pressure from numerous, well-resourced commercial lobbyists. What does this mean for a (more) social and green Europe? It is clear that the deregulation agenda in the EU undermines or even abolishes existing rules, while making new, progressive rules that much harder to introduce. Just look at these examples. The Circular Economy Package was initially introduced as a way to boost Europe’s transition towards the more sustainable use of resources. 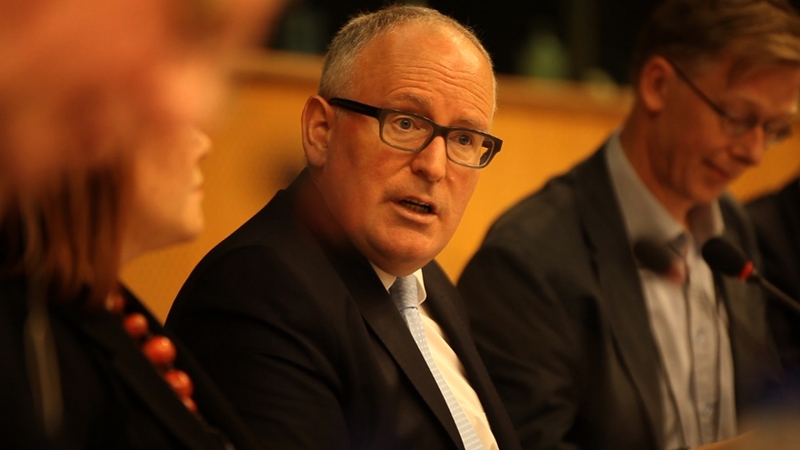 But in 2014, wearing his Better Regulation hat, Frans Timmermans withdrew it from the Commission’s workplan for 2015. Justifying the decision, Timmermans said at the time “We are proposing to withdraw the existing proposal on the circular economy to make way for a broader and more ambitious approach that can be more effective.” The revised package was duly introduced at the end of 2015, but failed to live up to the billing. Not only had there been a year’s delay, the new legislative proposal was weaker and lacked the promised ambition. A 'political' target for resource productivity was absent from the new package (as demanded by BusinessEurope in 2014), meaning an important step towards reducing absolute resource consumption was missing, and the EU-specific target for food waste reduction had also been dropped. Not surprisingly, BusinessEurope welcomed the new proposal while green groups expressed their huge disappointment. Under Better Regulation, proposals to introduce standardised maternity leave have also been scrapped. The bill, first introduced in 2008, received the support of the Parliament but was blocked by a handful of member states. Once again, BusinessEurope had been vocal in its opposition to the measure, claiming that “pregnant workers are already adequately protected” by current rules that date back to 1992 and that “it is not reasonable to come up at European level with rules which would significantly increase costs for companies and public finances”. The Commission has said it will re-visit the issue, but will it suffer a similar fate to the Circular Economy Package and be drastically weakened? Either way, expecting families are left reliant on decades-old legislation and employers are left unable to properly plan for the future. Meanwhile, in 2012 a trade union and employers’ organisation signed a framework agreement aimed at protecting hairdressers in the workplace. 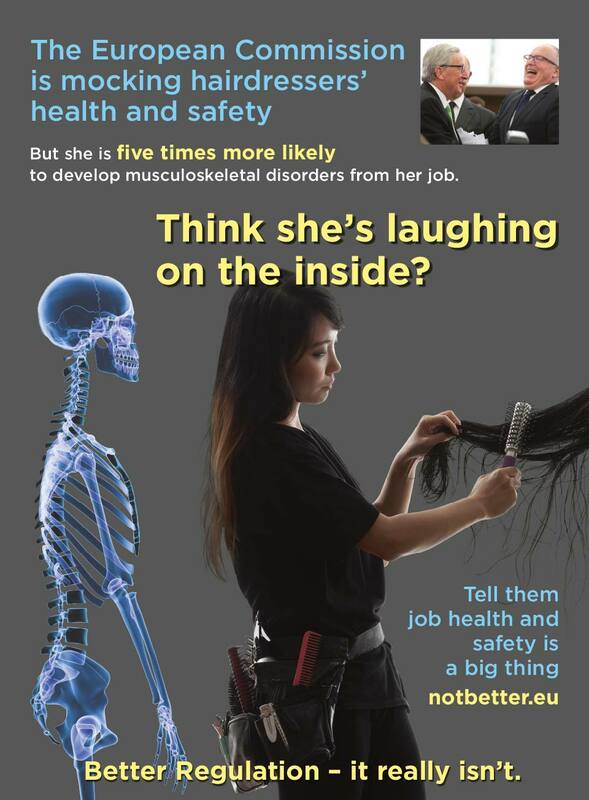 According to the union UNI Europa, hairdressers are ten times more likely than the average worker to develop skin conditions and five times more likely to develop musculoskeletal diseases such as arthritis and tendinitis. It is estimated that 20 per cent will, at some point in their lives, be affected by work-related asthma. This positive agreement to protect hairdressers should have been forwarded by the Commission to the Council for final approval and to make it binding on all member states. Under former Commission President Barroso, the agreement was ridiculed and stalled. “The EU should not be concerned with blond women on high heels,” stated Barosso. Under Juncker, not only has the Commission’s handling of the agreement continued to be slow, it was also mocked in a Commission publication claiming that the EU should not be big on small things. UNI Europa reacted with a campaign pushing the Commission to act. This case illustrates that agreements reached through social dialogue between employers and unions may not be protected from the reach of Better Regulation. And meanwhile hairdressers continue to suffer. How do corporate lobbyists use Better Regulation to achieve their aims? The rhetoric of Better Regulation - ‘simplification’, ‘burden reduction’, and ‘harmonisation’ - is now being used by industry lobbyists to pre-empt, delay, and weaken rules that are urgently needed to address occupational cancer rates. In the EU alone, over 100,000 people a year die due to insufficient protection against cancer-causing substances in the workplace, making the industries’ fight against stricter EU regulation of these carcinogens a severe threat to public health. A report by CEO Using ‘Better Regulation’ to make things worse shows how industry lobbies have been framing employee protection against work-related cancers as an ‘unnecessary’ burden on companies, and explains which tactics they have used to hollow out the EU’s revision of the Carcinogens and Mutagens Directive. When lobbyists use the language of the Better Regulation agenda they are likely to be well received by the European Commission which is so keen to cut red tape; indeed, the Commission’s proposal for the revision of the Carcinogens Directive only contains exposure limits for a small number of workplace carcinogens, and even those limits are set far too high to effectively protect workers from serious health hazards. Analysing lobby documents on workplace exposure limits for carcinogenic substances like silica dust and ceramic fibres, among others, CEO’s report shows how Better Regulation is in fact an attempt to reduce the regulatory ‘burden’ on businesses, regardless of the cost to people and planet, giving industry new opportunities to steer EU rule-making in a pro-business direction. The building blocks of Better Regulation (impact assessments; boasting about ‘sound science’; over-emphasising business costs; an emphasis on self-regulation and voluntary measures; more ‘stakeholder’ engagement; REFIT and fitness checks) have been instrumental in industry lobbying on the Carcinogens Directive. When the Commission presented a proposal for revising the Directive in May 2016, the draft contained new exposure limits for 13 substances. But the limits covered in the proposal were far too few and much too lax. In a follow-up initiative in January 2017, the Commission extended its proposal to include exposure limits for five more substances, bringing the number to 18. But its proposal does not come anywhere near the minimum of 50 carcinogenic substances which various member states, health bodies and trade unions have recommended for inclusion. The European Parliament, despite corporate lobbying being rife, has adopted a more progressive approach than the Commission, as steered by MEP Marita Ulvskog. This dossier is now in the trialogue process (March 2017). How are the ‘Dieselgate’ scandal and Better Regulation agendas linked? The Dieselgate scandal has shown what can go wrong when decision-makers get too close to corporate interests and a culture of industry self-regulation and light-touch rule-making is allowed to take hold. In the February 2017 report by Corporate Europe Observatory and Friends of the Earth Europe Driving into Disaster – How the EU’s Better Regulation agenda fuelled Dieselgate, we show how the car industry had been working to shape the EU’s regulatory agenda for decades – and how the Commission and member states were apparently happy to let it do so. Ten years before the Dieselgate scandal broke (when US regulators discovered that German car maker Volkswagen was using ‘defeat device’ software in diesel engines to reduce vehicles’ emissions during testing, effectively manipulating the results), in 2005, the Commission set up an advisory group to look at improving “competitiveness” in the European car industry. The Competitive Automotive Regulatory System for the 21st Century group (CARS 21) brought together representatives from the car industry and government officials. It was chaired by then EU Commissioner for Industry, Günter Verheugen; the car lobby group, the European Automobile Manufacturers Association (ACEA) was also invited, with its president, Volkswagen’s Bernd Pischetsrieder playing a leading role. The car lobby saw an opportunity to shape the rules in the industry’s favour, with a key target for ACEA being the way in which cars were tested on environmental, safety, and security standards. A dedicated sub-group within CARS 21 was tasked specifically “to scrutinise the regulatory framework and to identify possibilities for withdrawing or simplifying the legislation in force”. The lobby group ensured that CARS 21 focused on the principles and aims of ‘Better Regulation’ from its very first meeting. CARS 21 was a huge success for the car industry as it ushered in the idea that car manufacturers would ‘self-test’ a range of emission and safety elements in the overall approval process for new vehicles. The car industry’s persistent lobbying strategy had paid off, with the Commission opening the door to self-testing and endorsing ‘Better Regulation’ principles. Keeping in line with the Better Regulation agenda, in 2011 the Commission turned to industry once again for advice, this time looking for expertise on how to measure vehicle emissions under driving conditions, so-called “real driving emissions” (RDE). It established a technical working group, known as the RDE-LDV working group, which was again dominated by representatives from the car industry, with large delegations from ACEA. Following ‘Better Regulation’ principles, industry was involved in every stage of the legislation by the Commission, demanding that the proposed regulations were simplified, and insisting on the need for impact assessments to ensure cost effectiveness. This not only delayed the introduction of new regulation, it also ensured that industry concerns regarding costs were prioritised over impacts on health and the environment. Even since ‘Dieselgate’ broke, the Commission’s trust in the car industry’s expertise seems to remain unquestioned, leaving EU citizens exposed to illegal levels of toxic nitrogen dioxide (NO2) pollution from diesel cars, which contributed to an estimated 75,000 premature deaths in Europe in 2015 alone. The ‘Dieselgate’ scandal has revealed how the focus on simplified regulation that was meant to improve competitiveness has, in fact, allowed the car industry to set the agenda and shape the rules regulating the automotive sector. Rules were weakened and key responsibilities, including the enforcement of rules, were taken from the regulator and placed in the hands of the car industry. Companies’ commercial interests were prioritised over public interests. The Commission and member states effectively encouraged a push for a ‘simplification’ of the rules on type approval and introduced de facto EU-wide self-testing. ‘Better Regulation’ principles have been an invitation to industry to delay and weaken the EU’s commitment to more accurately test emissions from vehicles on the road. Read more in Driving into Disaster – How the EU’s Better Regulation agenda fuelled Dieselgate. Hasn't the UK government been pushing something similar? 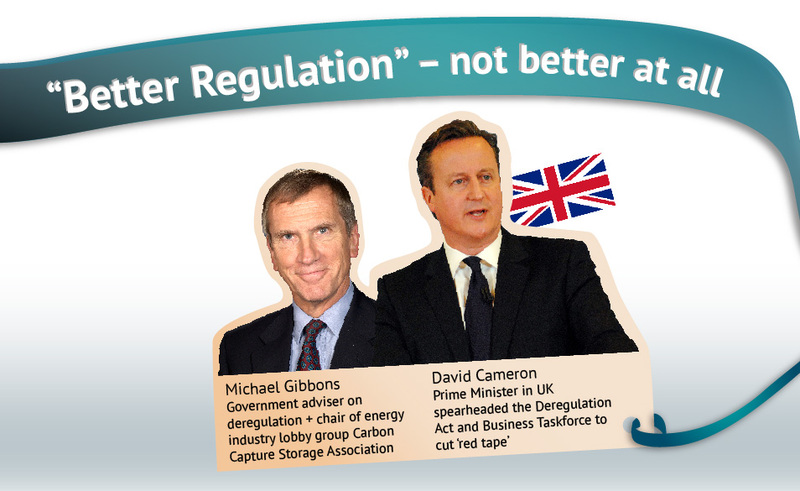 The deregulation agenda has been around in the UK since the 1980s and the Thatcher government. It picked up pace under New Labour, but the arrival of David Cameron in 10 Downing Street in 2010, coinciding with the wider economic crisis and the implementation of austerity policies, provided it with greater political impetus. In 2010, the UK government introduced a ‘one-in, one-out’ policy ie. for every £1 of additional cost imposed on business by new regulations, the government should save businesses £1 by removing or modifying existing regulations; as of 2016, the policy is now ‘one-in, three-out’. The new Deregulation Act requires those exercising specific regulatory functions to have regard to the desirability of “promoting economic growth”. Such regulators could include those regulating social care, drinking water quality, environmental protection, equality, food standards, health and safety, education standards, and many, many others. Meanwhile, the Red Tape Challenge, invited members of the public to suggest regulations that should be scrapped and the Regulatory Policy Committee, dominated by corporate interests, is an unelected body which has the power to delay new rules by vetoing departments’ impact assessments (and has now been replicated in the EU by the Regulatory Scrutiny Board). Finally, the Focus on Enforcement has invited businesses to make proposals on how regulation should be enforced in their sector (e.g. agricultural lobbyists advising government on how farm safety and animal welfare inspections should be carried out). What have been the effects of this in the UK? The impacts of deregulation in the UK have not been to simply cut back on red-tape and form-filling. Instead, important regulations have been weakened or scrapped. The speed limit for heavy goods vehicles (HGVs) travelling on single carriageway roads has now been increased from 40 to 50 miles per hour, something which the road transport industry supported to reduce congestion and transit costs. The majority of respondents to the consultation rejected the idea but the government went ahead anyway, with the impact assessment trading off the extra fatal and serious injury accidents likely to be caused by higher HGV speeds with the expected reduction in business costs. While the UK already has one of the most lightly-regulated labour markets among developed economies, businesses have continued to complain about the costs of complying with labour laws. In another Better Regulation trade off, cost reduction for businesses was prioritised over labour rights for workers by introducing new fees for employees who want to bring an employment tribunal case; doubling the period before employees can be protected from unfair dismissal from one to two years; and halving the minimum consultation period before collective redundancies (100 people or more) can be made from 90 to 45 days. Site waste management plans required construction companies to plan for how they would tackle the waste generated on the site of their construction projects. Evidence showed that they were “beneficial to the majority of organisations and most achieve significant cost savings through implementing them”. Not surprisingly then, businesses supported them and crucially, they were good for the environment too. But under the Cameron Red Tape Challenge they were abandoned because an impact assessment claimed that repealing the regulation would provide a net financial benefit to businesses! But perhaps the biggest impact of deregulation in the UK has been constraining the policy space for new rules to almost zero, even in new and emerging sectors which require totally new regulation eg. auto-enrolment into private pensions, e-cigarettes and many others. 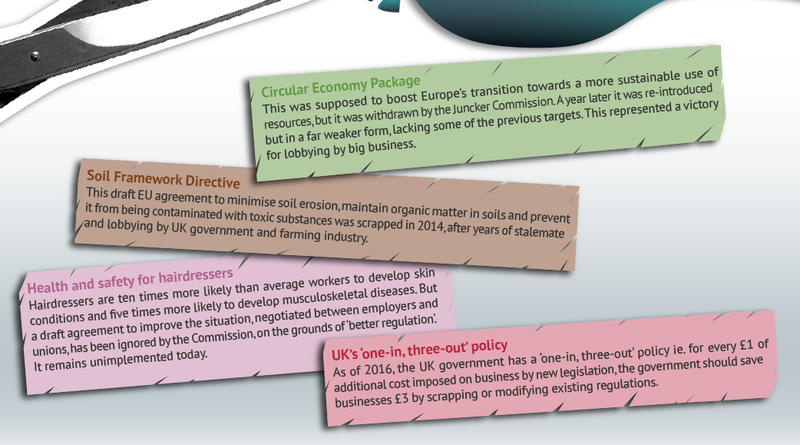 How does this deregulation agenda link with the UK’s Brexit vote? Now the UK has voted, via the June 2016 referendum, to exit the EU (probably in Spring 2019), focus in the UK is on what that exit will look like. The final outcomes of Brexit for the people of the UK, will be very much determined by local and national struggles. There are significant concerns from unions and NGOs that the present government will open an era of further deregulation. Isn’t there a similar proposal being negotiated in TTIP too? Not content with giving European big business an enhanced say in EU policy-making, proposals under the EU-US trade deal (TTIP) would seek to extend that to US trade authorities (acting on behalf of US corporations), binding both the EU and the US into this deregulation agenda. Not surprisingly, it was lobby groups on behalf of big business - BusinessEurope and the US Chamber of Commerce - which first lobbied the EU and US authorities to include it. 'Regulatory cooperation' is at the heart of TTIP meaning that, over time, the two regulatory rulebooks of the EU and the US would converge. In the EU where in most, but not all areas, regulations are tougher than in the US, this is likely to lead to further pressure for deregulation. But the negotiators have been canny. Fearing that legislators will reject any agreement which contains concrete proposals for deregulation in particular areas (allowing US chlorinated chicken or hormone-injected beef into the EU, for example), TTIP is likely to instead introduce new procedures which, once the TTIP dust has settled and it has been safely passed into law, will enable this hyper-deregulation phase to begin. An early warning system so that the European Commission (which has the monopoly on initiating legislative proposals or implementing acts at the EU level), would need to discuss the idea (and potentially adapt it) with US trade authorities and offer them cooperation, before they are brought up for discussion with EU elected representatives in the Council and in the European Parliament. Trade impact assessments which will have to include assessments of a given proposal’s impact on trade, or in other words, its impact on US companies. Business groups are to be able to influence the cooperation programme significantly. If corporations on both sides of the Atlantic can agree on a “substantive proposal”, there is a short-cut to include it in the official work programme. An institutional structure to guide the EU and US towards regulatory convergence. According to the EU proposal, it shall establish sectoral working groups (eg on chemicals, food standards, consumer rights) to work out strategies in specific areas and business lobby groups will have privileged access. It will be non-elected entities that will be the main actors under “regulatory cooperation”. There will also be a series of sub-agreements on special procedures for particular sectors, and the influence of corporate interests is already making itself felt. The EU proposal on chemicals is strikingly similar to that of the chemicals lobby; the proposal on pesticides will block development of rules on pesticides in the US as well as the EU; and the proposal on financial regulation was hailed by TheCityUK, the financial lobby group, as "reflect[ing] so closely the approach of TheCityUK that a bystander would have thought it came straight out of our brochure on TTIP”. Regulatory cooperation under TTIP is set to have a serious effect in the EU. It will increase the influence of the US trade authorities in EU politics, and it will strengthen the hand of US corporations, often working in tandem with their European counterparts. In practice, the regulatory cooperation agenda and the Better Regulation agenda will work hand in hand and be mutually reinforcing. Both processes are creating obstacles and delays for decision-makers who want to introduce new regulations, and they risk creating “regulatory chill” as law makers are discouraged from introducing new measures in the public interest. Recently, the public was allowed to see a first glimpse of the US position on “regulatory cooperation” under TTIP. It happened when Greenpeace Netherlands was able to publish a series of leaked negotiation documents. From these documents we know that in general terms, the two sides agree on an approach to “regulatory cooperation”, on some points the EU has the most far reaching proposals, and on others the US is in the lead. The US, for instance, is clear in its attacks on the principles guiding EU food standards and chemicals regulation, and its negotiators suggest that anyone with an interest should be able to nominate a regulation for scrapping, if, for instance, it is deemed “too burdensome”.